.Device Supported: Flat Panel Display. Maximum Load Capacity: 350 lb. Minimum Screen Size Supported: 60.Maximum Screen Size Supported: 100".Features: Tilt. Features: Horizontal Adjustment. Features: Adjustable Viewing Angle. Features: Durable. Features: Scratch Resistant. Color: Black. VESA Mount Compatible: Yes. VESA Mount Standard: 200 x 200.VESA Mount Standard: 400 x 200.VESA Mount Standard: 300 x 300.VESA Mount Standard: 400 x 400.VESA Mount Standard: 800 x 400.VESA Mount Standard: 800 x 600.Material: Metal. Height: 32.8".Width: 44.9".Depth: 5.1".Weight (Approximate): 17.36 lb. Package Contents: Tilt Wall Mount for 60" to 100" Flat-Screen Displays. .Mounting Hardware. .Owner's Manual. .Green Compliant: Yes. Green Compliance Certificate/Authority: RoHS. Limited Warranty: 5 Year. Package Contents. .Tilt Wall Mount for 60" to 100" Flat-Screen Displays. .Mounting Hardware. .Owner's Manual. ."
.Device Supported: Flat Panel Display. Maximum Load Capacity: 165 lb. Minimum Screen Size Supported: 32.Maximum Screen Size Supported: 70".Features: Tilt. Features: Adjustable Viewing Angle. Features: Bubble Level. Features: Flexible. Features: Scratch Resistant. Color: Black. VESA Mount Compatible: Yes. VESA Mount Standard: 600 x 400.Material: Metal. Depth: 1.8".Weight (Approximate): 5.94 lb. Package Contents: Tilt Wall Mount for 32" to 70" Flat-Screen Displays. .Mounting Hardware. .Owner's Manual. .Compatibility: LCD TV. Green Compliant: Yes. Green Compliance Certificate/Authority: RoHS. Limited Warranty: 5 Year. Package Contents. .Tilt Wall Mount for 32" to 70" Flat-Screen Displays. .Mounting Hardware. .Owner's Manual. ."
.Device Supported: Flat Panel Display. Maximum Load Capacity: 165 lb. Minimum Screen Size Supported: 26.Maximum Screen Size Supported: 55".Features: Tilt. Features: Durable. Features: Bubble Level. Features: Scratch Resistant. Features: Adjustable Viewing Angle. Color: Black. VESA Mount Compatible: Yes. VESA Mount Standard: 100 x 100.VESA Mount Standard: 200 x 100.VESA Mount Standard: 200 x 200.VESA Mount Standard: 400 x 200.VESA Mount Standard: 400 x 400.Material: Metal. Weight (Approximate): 6.77 lb. Package Contents: Tilt Wall Mount for 26" to 55" Flat-Screen Displays. .Mounting Hardware. .Owner's Manual. .Compatibility: LCD TV. Green Compliant: Yes. Green Compliance Certificate/Authority: RoHS. Limited Warranty: 5 Year. Package Contents. .Tilt Wall Mount for 26" to 55" Flat-Screen Displays. .Mounting Hardware. .Owner's Manual. ."
.Device Supported: Flat Panel Display. Maximum Load Capacity: 88 lb. Minimum Screen Size Supported: 13.Maximum Screen Size Supported: 27".Features: Tilt. Features: Durable. Features: Scratch Resistant. Features: Adjustable Viewing Angle. Color: Black. VESA Mount Compatible: Yes. VESA Mount Standard: 75 x 75.VESA Mount Standard: 100 x 100.Material: Metal. Weight (Approximate): 15.87 oz. Package Contents: Tilt Wall Mount for 13" to 27" Flat-Screen Displays. .Mounting Hardware. .Owner's Manual. .Compatibility: LCD TV. Assembly Required: No. Green Compliant: Yes. Green Compliance Certificate/Authority: RoHS. Limited Warranty: 5 Year. Package Contents. .Tilt Wall Mount for 13" to 27" Flat-Screen Displays. .Mounting Hardware. .Owner's Manual. ."
Tripp Lite DDR1327SFC Display Flex Arm Desk Mount 13-27 in. Supports weights of up to 22 lbs. Screen Size Compatibility - 13 - 27 in. VESA Pattern - 75x75; 100x100 mm. .Device Supported: Flat Panel Display. Maximum Load Capacity: 165 lb. Minimum Screen Size Supported: 32.Maximum Screen Size Supported: 70".Features: Durable. Features: Adjustable. Features: Bubble Level. Features: Scratch Resistant. Color: Black. VESA Mount Compatible: Yes. VESA Mount Standard: 600 x 400.Material: Metal. Weight (Approximate): 5.18 lb. Package Contents: Fixed Wall Mount for 32" to 70" Flat-Screen Displays. .Mounting Hardware. .Owner's Manual. .Compatibility: LCD TV. Green Compliant: Yes. Green Compliance Certificate/Authority: RoHS. Limited Warranty: 5 Year. Package Contents. .Fixed Wall Mount for 32" to 70" Flat-Screen Displays. .Mounting Hardware. .Owner's Manual. ."
.Device Supported: Flat Panel Display. Maximum Load Capacity: 88 lb. Minimum Screen Size Supported: 13.Maximum Screen Size Supported: 27".Features: Durable. Features: Scratch Resistant. Color: Black. VESA Mount Compatible: Yes. VESA Mount Standard: 50 x 50.VESA Mount Standard: 75 x 75.VESA Mount Standard: 100 x 100.Material: Metal. Weight (Approximate): 1.41 lb. Package Contents: Fixed Wall Mount for 13" to 27" Flat-Screen Displays. .Mounting Hardware. .Owner's Manual. .Compatibility: LCD TV. Assembly Required: No. Green Compliant: Yes. Green Compliance Certificate/Authority: RoHS. Limited Warranty: 5 Year. Package Contents. .Fixed Wall Mount for 13" to 27" Flat-Screen Displays. .Mounting Hardware. .Owner's Manual. ."
.Device Supported: Flat Panel Display. Device Supported: Curved Screen Display. Device Supported: Monitor. Number of Displays Supported: 1.Maximum Load Capacity: 88 lb. Maximum Screen Size Supported: 80.Color: Black. VESA Mount Standard: 300 x 300.VESA Mount Standard: 400 x 200.VESA Mount Standard: 400 x 400.VESA Mount Standard: 600 x 400.VESA Mount Standard: 800 x 400.Height: 21.6".Width: 38.8".Depth: 17.3".Weight (Approximate): 22 lb. Package Contents: Wall Plate. .2 x Adapter Brackets. .Security Bar. .Wall Plate Level. .2 x End Caps. .4 x End Cap Screws. .2 x Anti-skid Blocks. .4 x M5 x 14 Screws. .4 x M6 x 14 Screws. .4 x M6 x 30 Screws. .4 x M8 x 20 Screws. .4 x M8 x 30 Screws. .4 x Washers. .8 x Small Spacers. .4 x Large Spacers. .5 x Anchor Bolts. .5 x Concrete Anchors. .5 x 20 mm Washers. .Combination Lock. .Owner's Manual. .Limited Warranty: 5 Year. Package Contents. .Wall Plate. .2 x Adapter Brackets. .Security Bar. .Wall Plate Level. .2 x End Caps. .4 x End Cap Screws. .2 x Anti-skid Blocks. .4 x M5 x 14 Screws. .4 x M6 x 14 Screws. .4 x M6 x 30 Screws. .4 x M8 x 20 Screws. .4 x M8 x 30 Screws. .4 x Washers. .8 x Small Spacers. .4 x Large Spacers. .5 x Anchor Bolts. .5 x Concrete Anchors. .5 x 20 mm Washers. .Combination Lock. .Owner's Manual. ."
The AVF MRC1102-A is a tilt and turn desk mount for 13 to 27 inch screens and supports up to 22 lbs. Not only does it free up valuable desk space but it also places the monitor at your desired viewing position for added comfort and reduced strain. The monitor can be tilted 15 degrees and adjusted in height 17.9 inches placing it at the ideal eye level. It rotates 360 degrees for easy portrait or landscape viewing and is VESA compatible with hole patterns 75x75mm thru 100x100mm. Can be attached either clamped to the edge of your desk or clamped through the desk cable access hole with a thickness from 0.4 - 3.1 inches. Cable management is provided through the upright for an organized appearance and comes with a 2-year warranty. 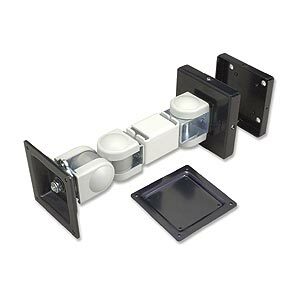 Our new pivoting mounts attaches your LCD monitors (which have 75mm or 100mm square VESA standard mounts) securely to most any wall. Constructed of heavy-duty steel with sturdy nylon pivot washers it holds your monitor right where you want it with no shake or unwanted motion. Great for kiosks and multiple monitor arrangements.